In the quarter century from 1872 to 1896 the population just about doubled in the kingdom from 57,000 to 109,000; Honolulu doubled from 15,000 to 30,000. This extension of settlement combined with the growing attraction and popular resort use in Waikīkī meant transportation became more of a problem. People who could afford them had horses and buggies; independent buggy served as available on a limited basis and mass production of the gas automobiles didn’t get underway until the turn of the century, so a more organized public transportation system was needed. (1) From Nuuanu Street, the chief residential quarter, through the business part of the City skirting the Docks and Custom House, to the Royal Hawaiian Hotel, and thence along Beretania Street, touching the extensive Portuguese quarter, to a point where at several closely populated Avenues converge. (2) Starting from the densely-populated Chinese quarter, past the King’s Palace, the Legislative Chambers, the Opera House, and the Native Church, to the principal pleasure resorts and residential district of the well to-do classes in the southern suburbs. The tramcars were well patronized, first as a novelty and then as a proven convenience. The speed limit for the cars was eight miles per hour. By July 1889, the trams speeded along King Street from Kalihi to Waikīkī, Beretania from Nuʻuanu to Punahou. The streetcar tracks added to the traffic problem on Honolulu’s main streets, none of which were wide enough. As far back as 1880, a newspaper article gave an entertaining description of traffic conditions then existing. The animal-powered service was short-lived, making its last run on December 23, 1903; Hawaiian Tramways, Ltd. was taken over in 1900 by the Honolulu Rapid Transit & Land Co.
Honolulu Rapid Transit operated electrically powered buses on Honolulu streets. Power came from overhead wires. Ten new buses began service on August 31, 1901, replacing the horse and mule drawn cars which had in service 33 horse cars, 113 horses and 194 mules. Eventually more comfortable, speedy gasoline-powered buses replaced other means of mass transit for Honolulu and rural Oʻahu. 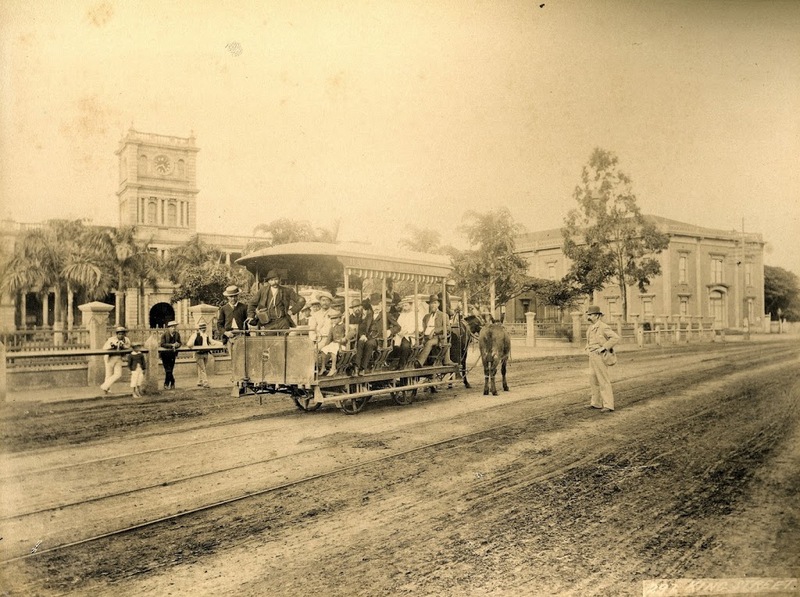 The image shows a mule-drawn streetcar on King Street in front of Aliʻiolani Hale. In addition, I have added related images in a folder of like name in the Photos section on my Facebook and Google+ pages.